VJTI is a 128 year old premier engineering institute located in the heart of Mumbai. 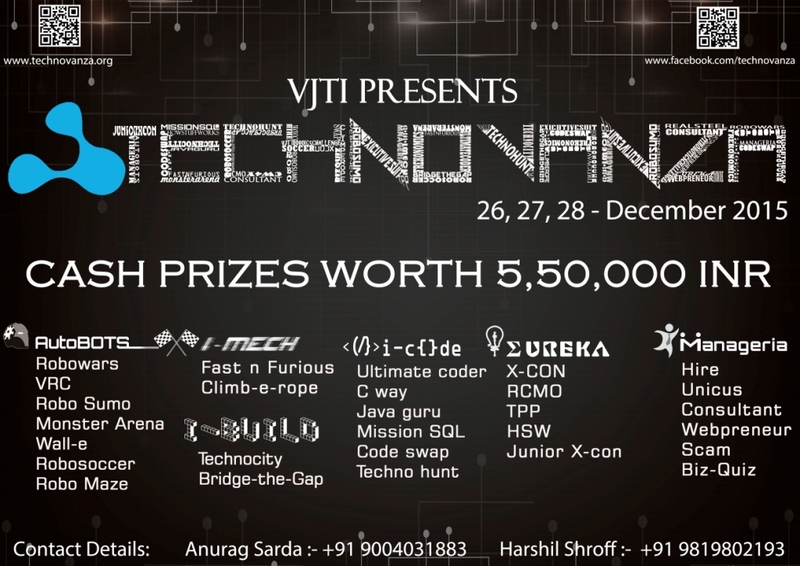 Technovanza is VJTI’s National Level Techno-Management Event. Keeping in mind our core values of working as a team with integrity and professionalism and the ultimate aim of “Taking Technology to the Society”, it is one of the most awaited events in technical calendars throughout the country. Through the various events, exhibitions, the Guest Lecture Series, conferences and social initiatives undertaken by the students, Technovanza has become an awe-inspiring and enriching learning experience for visitors and participants alike! Technovanza 2015 will host over 40 competitions with cash prizes upto 5.5 lacs to be won galore, and also a grand College Cup for the best participating college.